Likud Minister says Jewish Home party head has a 'political issue,' Justice Minister Shaked says her party will uphold its obligations. Israeli Prime Minister Binyamin Netanyahu's Likud faction slammed Education Minister Naftali Bennett's Jewish Home faction for insisting Netanyahu tell US President Donald Trump that Israel is in favor of moving the US Embassy from Tel Aviv to Jerusalem. Likud took Bennett's demand as an attack on Netanyahu, and chastised Bennett for "making sure the Prime Minister knows what to say to the press." Environmental Protection Minister Zeev Elkin (Likud) on Monday morning told Army Radio that "Naftali Bennett has a political problem. He always has to be different somehow. He'll keep doing whatever he can to make himself stand out." 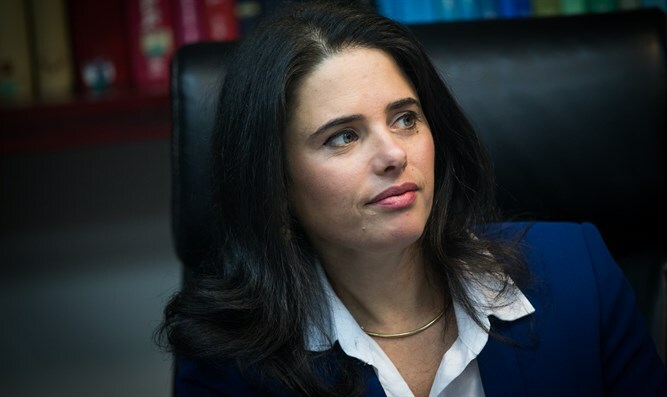 Justice Minister Ayelet Shaked (Jewish Home) explained her party's stance. "Telling Trump what Israel's stance is on the Embassy move is not attacking the Prime Minister," Shaked said. According to her, various parties are attempting to silence her party's voice. "I will not allow that to happen," she said. "We were chosen to express clear opinions and to apply the agenda we promised."